We finished our vacation today and I thought I would pick some interesting photos from the last few days. 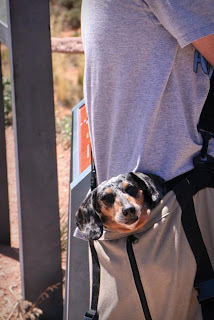 It was a dog's life at Arches Nat'l Park yesterday. As we came off a trail I looked over and this man had his dog in a bag hanging over his shoulder. Wow, wish someone carried me around the park! This little beggar was at Bryce Canyon Nat'l Park. I guess the French tourists couldn't read the signs saying not to feed the animals. 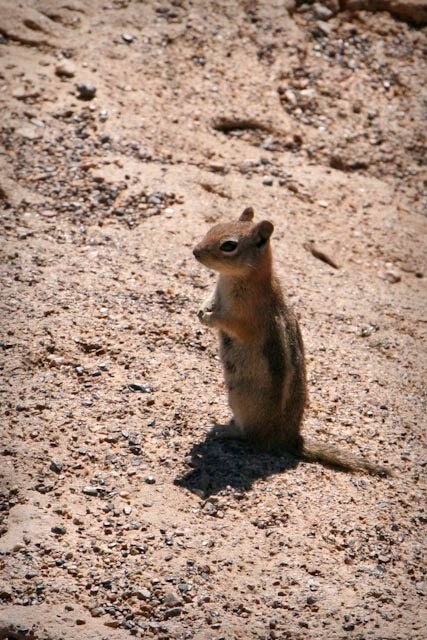 This was the strangest thing we saw in Zion Canyon. We got off a tram and heard a distinct "gobble". 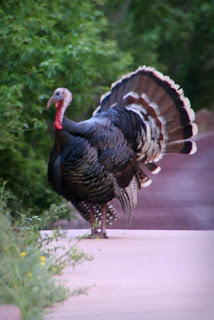 Looked over and this gentleman was showing off his tail feathers for some females that were nearby.